Indonesia: Great Power on Australia's Doorstep? Indonesia: Great Power on Australia’s Doorstep? Last month at the Australian National University (ANU) Professor Hugh White delivered a solid speech that lucidly and methodically explained why we, Australia, should be considering Indonesia with more care. It will take some time for these perceptions to erode. But it is equally important that we do not replace them with those that may mischaracterise Indonesia. Let’s take Indonesia’s democracy, for example. Lowy’s poll also states that “62% of Indonesians say democracy is preferable to any other kind of government and there is near universal agreement on three core democratic values – the rights to a fair trial, freely express yourself and vote in national elections.” How this is practiced, however, may be a different story. A New York Times article warned that Indonesia is no model for a Muslim democracy, citing its mixed human rights record and lack of religious freedom as evidence. Admittedly, the case by the Human Rights Watch author comprises a quick grab of examples presented in highly emotional terms, but the take-home message is clear: Indonesia’s democracy is different. Sure it’s a no-brainer, but it may surprise us to learn the extent to which ethnic and religious criteria shape Indonesia’s elections. That is, Javanese Muslims have, historically, dominated politics and are perceived to be more viable candidates than their non-Javanese, non-Muslim counterparts. Given our Prime Minister is a non-religious, unmarried, Welsh-born woman, that a potential leader is discriminated against in ethno-religious terms is anathema to our political system should give us a moment’s pause for thought. While we, and others like the US, are turning to enthusiastically embrace the democratic character of our northern neighbour, it would serve us well to carefully appraise the challenges of Indonesia’s ongoing democratic development. This is not to say this is a bar to good relations; quite the contrary. Australia must make an effort to understand these challenges and know how to engage with them without being paternalistic. If Australia and Indonesia are to work closely together in the Asian century, a deep understanding of each other’s political systems and working with them is necessary. Second, Indonesia will be more than a middle power, and even perhaps a great power. There has been much discussion on whether Indonesia, given current growth rates, could outstrip India’s position in the BRICS grouping. Despite this optimism, according to one commentator (and it’s worth reading Grenville’s post), there are still significant political challenges holding Indonesia back. For one, there appears to be no clear successor to President SBY, with current candidates ranging from former generals like Prabowo Subianto, to Megawati Sukarnoputri, to tycoons like Aburizal Bakrie. Building on the discussion above on Indonesia’s democratic practices, with speculation abound about the nomination of Ani Yudhoyono, wife of the Indonesian President and sister of the Indonesian Army’s Chief of Staff, one wonders about the state of nepotism there. I hope I’m wrong. This three–part series in last week’s Jakarta Globe exposes the lack of military business reform in the country. Without robust systems of accountability and practices that encourage transparency and due diligence, Indonesia risks undermining its own developments. Reliable maintenance of the rule of law remains problematic. While Indonesia has made attempts to grapple with military reform and eradicate corruption, these articles show that the country still has a long way to go. As Indonesia grows in wealth and in confidence, it will head down the road of becoming a middle power. But its ability to transform into a great power will be hindered by domestic political challenges, and thus an inability to translate its wealth into military capability commensurate with great power status. 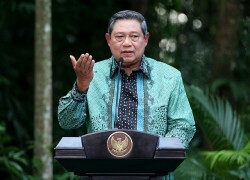 The right kind of President—he/she who can best cultivate the country’s wealth from natural resources, maintain high economic growth rates, reduce poverty, spur reform, maintain Indonesia’s clout within ASEAN, consolidate territorial integrity and domestic security, among other wishlist items—will no doubt help Indonesia comfortably secure a place in the upper bracket of middle power status. But what happens when Indonesia’s future President comes from a cadre of military officers who served in East Timor and who might be Australiaphobic? Earlier this week, Australia’s Ambassador to Indonesia, Greg Moriarty, warned of growing economic nationalism in the country resulting in investment conditions that are not necessarily in Australia’s interests. Let’s hope this trend does not continue. Third, White stressed the de-emphasis of aid in the relationship. He stated that there is a particular psychology attached to the receipt of aid. While there are many people in Indonesia who live in poverty and need our help, it was no basis for the bilateral relationship or the lens through which we should see Indonesia. As White underscored in an interview last month, it leads Australians to treat Indonesians in a patronising manner. White’s suggestion that we redirect aid money towards sending 10,000 Australian students each year to learn about Indonesia is well-intentioned, but we’d be hard-pressed getting even a third of that number across the education system. But again, I hope I’m wrong. As one blogger pointed out this week, language study comes from an interest in culture. But it also comes from repeated exposure to the other culture and repeated contact with people. That Indonesia features obliquely in popular soap operas is not indicative that it is part of our thinking. The solution to piquing interest in Indonesian culture will come with the sense that Asia is part of Australia. That is, as continental European faces are as commonly featured in mainstream media alongside Anglo-Celtic ones, familiarity with Asia will come with increased exposure: particularly newsreaders, politicians, business and community leaders, the actors in advertising campaigns, performers, and athletes. Exchanges are useful but they are usually led by travellers and students who are already willing to engage beyond Bali’s beaches. Perhaps Indonesian-Australians could lead the charge, perhaps change will come with time. It has been 14 years after the fall of Suharto and despite the challenges that are still abound, Indonesia has transformed remarkably. I want to be optimistic about the future of the relationship between Australia and Indonesia, and I am in furious agreement with White about strategic and cultural imperatives that should drive this, but we must be wide-eyed about the challenges that lay ahead.